Over the weekend a former faculty member, Kurt Jenne, passed away. He had just turned 68. Kurt was a wonderful colleague who took disability retirement when a memory disorder made it impossible for him to continue working. Kurt came to the Institute of Government after spending a year at Princeton University as a Fellow in the Woodrow Wilson School of Public and International Affairs. He had served for the immediately preceding three years as Chapel Hill’s Town Manager. 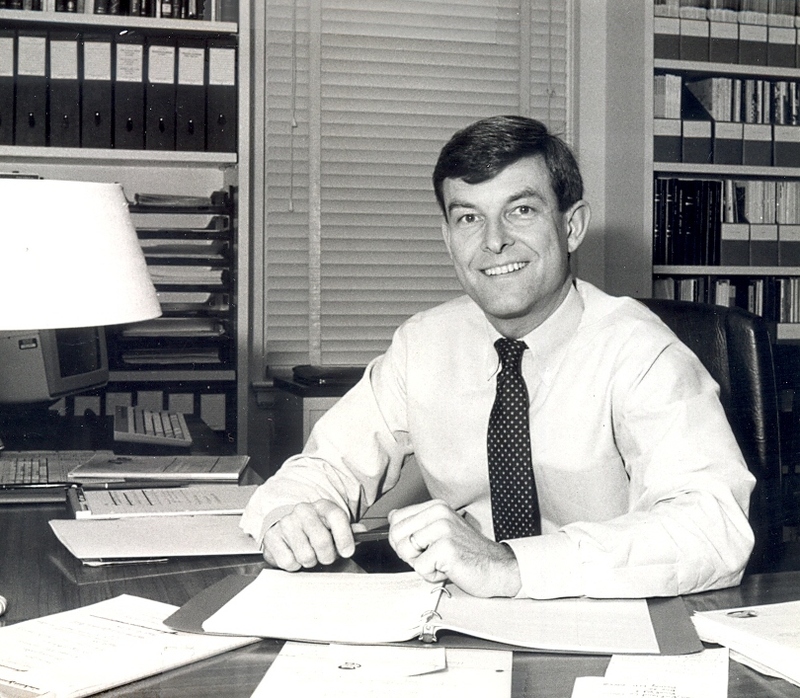 Kurt started with Chapel Hill as a planning intern in 1970 while getting his Master of Regional Planning and he worked in various planning and community development roles until he was appointed town manager in 1975. In a letter to John Sanders (Director of the Institute) in 1979 about his career options after his year at Princeton, Kurt wrote that “[t]he Institute of Government is an institution in which I have been most interested for a long time. I would like to find out whether my skills and experience are appropriate and valuable to what the Institute will be doing in the near future . . . .” Incredibly valuable as it would turn out. Kurt returned to Chapel Hill to get his PhD in City and Regional Planning, and he worked at the Institute in various roles until he finished in 1984 and became a full-time faculty member. He carved out important areas of work during his time with the Institute. As a former manager Kurt was a perfect choice to work with local government managers, and he did it brilliantly. The managers respected him as one of their own, and they also respected him for his knowledge, good judgment, and willingness to give them candid feedback. Kurt helped local governments with the process of recruiting and evaluating their top managers, and he helped many others design and implement strategic planning processes. Kurt was especially skillful in facilitating governing board-manager retreats, which he seemed to enjoy more than almost any other work. He liked being out in the field and helping people in tangible ways, and he enjoyed the give-and-take of a retreat. They always seemed to recharge his batteries. He would joke sometimes about having just returned from a retreat in “Burning Privy, North Carolina,” one of his colorful ways of saying an out-of-the-way small town. In truth, he loved doing the work and he respected all of the people he encountered. A commitment to public service was one of Kurt’s core values and it was evident in so many ways beyond his role as a faculty member with the Institute. He was enormously proud of his military service in the U.S. Army, including long service as a colonel in the reserves. His official resume also proudly listed his service as Chief Judge, Orange County Board of Elections, Lincoln Precinct. He took those responsibilities seriously and always worked at the polls on election days. Kurt was a person who carried his weight as a faculty member, and his practical focus and strong work ethic meant that he was called upon regularly to serve on important internal committees. Kurt was smiling and upbeat whenever I saw him, and he had a distinctive walk that reflected his boundless energy. I have a vivid image of seeing Kurt in the distance on many occasions as he walked toward our building from Woolen Gym. It looked as if he had springs on the bottoms of his feet as he bounded skyward with each stride, his arms pumping in a steady rhythm. It was purposeful and somehow joyful all at the same time. For me that walk reflected Kurt’s personality. He had a generous and optimistic spirit. Notwithstanding his experience in the Army and the University, two organizations that place importance on categorizing people by rank, Kurt treated everyone with the greatest respect. He was no elitist. I particularly remember Kurt spending time with our support staff in ways that communicated to everyone that they were valued colleagues. He was instrumental in promoting a culture of collegiality that embraced everyone who was a part of the organization. I still remember the day I discovered that he was experiencing some kind of memory disorder. I had just received a letter from an upset county commissioner who was complaining that Kurt had not followed through in scheduling an important meeting with his board. It was totally uncharacteristic and so I went up to his office to see what had happened. Kurt’s office always was well organized with neatly stacked files and everything in its place. The only difference this time was that he had Post-It notes stuck all over the place, very neatly, to remind him of deadlines, appointments, and anything else that he might need to remember. He realized that something was wrong and he had a strategy for working around it. We pieced together that the county commissioner probably had called and then Kurt promptly forgot about it before he could write anything down. Kurt still had the military discipline that allowed him to complete a PhD while working at the Institute, but he was losing the memory needed to make sense of the neatly organized rows of information. He took disability retirement about ten years ago once it became clear that he could no longer do the work that he loved so much. His memory gradually and relentlessly deteriorated from that time forward. Notwithstanding that his dementia was arbitrary and unfair and maddening, Kurt never felt sorry for himself. Each time I saw him over the years he was smiling and upbeat. I last saw Kurt about a month ago at the residential care facility where he was living in Chapel Hill. He no longer recognized me and he didn’t seem to connect to anything I talked about. At the same time, however, it was easy to see the old Kurt inside. He smiled and he talked in the same upbeat way that I had seen so many times over the years. His memory had failed him, but his kind and generous personality had not diminished. It continued to shine brightly. The following invitation is from Kurt’s children and Margaret Henderson. They all loved and cared for Kurt. Margaret has been a source of support for Kurt and inspiration for those of us who have watched her handle their hard path together with a special grace. It was Kurt’s great fortune that they found each other. What: A purely informal gathering to acknowledge the passing of Kurt Jenne and celebrate his presence in our lives. Who: Anyone who wants to come is welcome. There will be a memorial service for Kurt later on in the spring. In lieu of flowers, the family asks that contributions be made to The Charles House in Carrboro, an adult day care facility that provided valuable support and guidance in the last years of Kurt’s life. I am grateful to have met Kurt and experienced his generosity. He allowed me and my children to live in his home temporarily when I moved to NC many years ago while he stayed elsewhere. As I lived there, I encountered unending style expressed with humor and artistry. I browsed through his books and began reading his collection of Elmore Leonard novels. Now I have read all of Leonard’s books and eagerly look forward to the next release. And each time I picked up one of his books, I think of Kurt. He was a generous soul, and a great reader. Kurt was a great guy with a wonderful sense of humor. He had a gift for telling future managers how it really is and how to survive. He will be missed! I remember the spring in his step as well. I’ll never forget Susan Dunn once referred to him as “Mr. Spit and Shine”. I did not know Kurt personally, but have heard his name mentioned frequently over the years. Mike, reading your post makes me wish that I had crossed paths with him. Your thoughtful and moving words demonstrate the character of the man, and provide a wonderful tribute to his life and work at the Institute of Govt. I extend heartfelt condolences to his family and those who knew him well. He truly was a wonderful colleague. Lisa Wright reminded me that another former employee used to call him “Mr. Spit and Polish.” And yet he was an incredibly warm and engaging person. I remember working with Kurt to plan, and then traveling about the State with him to produce, the Schools for New Mayors and Council Members, back in the day when I was responsible for the Schools for New County Commissioners (predecessors to the Essentials courses). We had a great time together, sharing ideas and enjoying each others’ company. I especially recall one visit to Edenton, during which we called on one of the local officials (perhaps the manager), and were treated to a very enjoyable evening. Kurt was always interested in helping elected officials learn more about their key staff members–the clerk, the manager, and the attorney–and together we designed some programs that I recall as being quite effective. Kurt was kind, upbeat, and a pleasure to be around and to work with. It may sound trite, but he was truly an officer and a gentleman. He embodied the standards towards which every School of Government employee should aspire. Kurt was a super colleague. I can still hear his laugh. He contributed so much to the Institute of Government, from working closing with our summer intern program for undergraduates to helping plan the renovation of the Knapp-Sanders Building. I’ve missed him since he left the building. I had forgotten about Kurt’s love of staying at Bed and Breakfasts whenever he traveled. Brings back memories of him talking about his favorite places in Wilmington and Asheville. I met Kurt for the first time in the late 70′s. He did several Board/Manager retreats for me over the years and did a great job. I attended his 3 week executive development program at the Institute which is when I really got to know him. I just found out about his death on the 28th, but this past weekend I was going through some old files at home and found an e-mail Kurt had sent me in the summer of 2002 offering condolences following my wife’s death. This would have been about the time he realized he was not well. Kurt was a great person and I am saddened by his passing. We began to lose each other as he began to lose his memory such a long time ago. He was dealt a cruel hand, but played it with magnificent grace and good humor almost all of the time, seldom showing frustration when we were together. Kurt was a colleague who became a friend. He was one of the few who really understood the peculiar challenges of being the town manager in Chapel Hill, and offered a sympathetic ear. We traded stories that helped me laugh and gave me perspective. He facilitated Town Council retreats with an even hand and objectivity; and, he guided the Counil to helpful performance evaluations that had actionable content. I enjoyed teaching with him in the final years of his service to the MPA Program. I enjoyed arguing with him when we disagreed. I enjoyed his quick smile, his quick wit, and even his quick temper, which I seemed to have a special ability to provoke. He was my friend. Kurt walked in the library, smiling and at ease, asking me if I knew why he was here. I told him since he was wearing a suit and tie, it must be important and we would go in search of the appropriate event. What I remember about those meetings was his grace, and his smile…Kurt was a beautiful, gentle man, who gave us an an example of how to handle crisis with class. This was such sad news to wake up to this morning. I had the opportunity to work across the hall from Kurt for many years and also to work with him on numerous teaching opportunities, such as special versions of the former “Newly Elected” sessions. We ALWAYS stayed in a fashionable Bed and Breakfast of Kurt’s choosing. For years, even after his retirement, even though he had trouble with my name, he remembered we were at a B&B and I got the room with the “fainting couch”. Also, each year we had a tradition of sharing “beverages” with several other colleagues in Kurt’s office on the day of the School’s Holiday Luncheon. Kurt would always provide the necessary wares. In the final years, we would take csre of those details, but insist he be the host. Great memories. He was a great neighbor, friend, and colleague and I am so thankful I had the chance to work with him as much as I did.